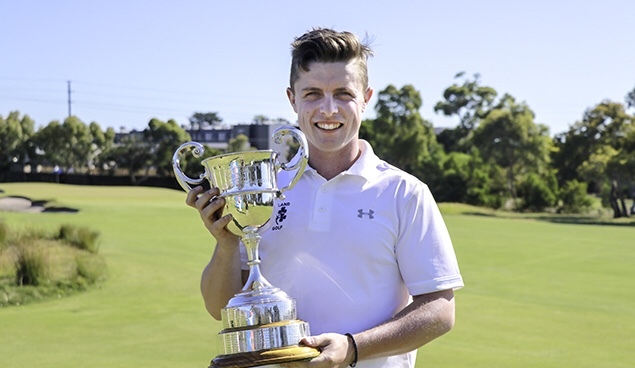 Ireland’s Conor PURCELL has won the Australian Men’s Amateur at Woodlands G.C. in Victoria. He beat Nathan BARBIERI on the 37th hole of an exciting championship match after the Australian pulled an approach into the par 4 1st’s green and was unable to get up and down. Purcell had led the Final 4 Up with 10 holes to play so having been pegged back will have been delighted to finally get the job done. His brother Gary, a tennis coach in Australia, caddied for him making it a family affair. His victory comes with two nice playing exemptions; the ISPS Handa Vic Open (7-10 February) and the Emirates Australian Open (5-8 December). In a nice gesture by Woodlands G.C. Conor was also awarded honorary membership of the host course at the prize giving. Having chosen to leave the University of North Carolina, Charlotte after his sophomore year in 2018 this represents a superb start to the new season for the man from Malahide, near Dublin. In my opinion he has now assured himself, even at this early stage, of a place in the 2019 Great Britain and Ireland 10-man Walker Cup team. A win in 2019, a strong match play track record and a high ranking in the SPWAR tick the three main boxes I would be looking at as a selector. As you can see from the above table this victory lifted Conor to a career high of 20th in the Scratch Players World Amateur Ranking. 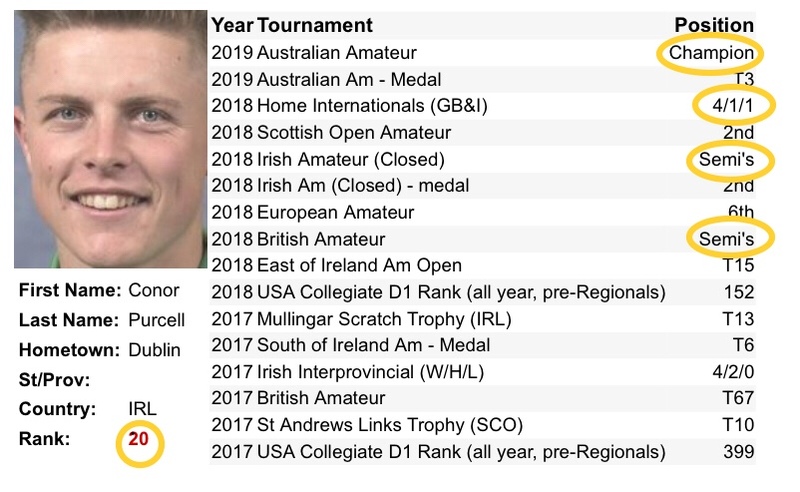 Having also reached the Semi-Finals of the 2018 Amateur Championship and Irish Amateur Close and enjoyed a winning record in last year’s Men’s Home internationals no one can question his match play credentials. With some of the pressure now off him I expect Conor to continue to perform well this year. He can also look forward to the 2019 Amateur Championship, the most important event on the path to Walker Cup selection, being staged at his home club Portmarnock G.C. in June. What a prospect to play the British Amateur on your own course – having already been crowned the Aussie champion… that’s worth a hole or two. Agree that Conor has got to have as strong a claim as anyone to being first name on the teamsheet.